I was born in Chongqing, China, a major city of 30 million people in southwestern mainland China and one of the five national central cities. Chongqing is in the center of Sichuan Province making it the culinary center for the best Sichuan cuisine as well. Sichuan Spicy Cold Noodles is one of the most famous Sichuan cuisines on the menu. When I was a child this was my favourite dish and my mom always had it prepared for my brother and I. Ever since I made this dish for my husband it has become one of his favourite dishes too especially in the summer. This dish is very simple and if you like spicy food you will love this dish. One of the unique ingredients is ground Sichuan peppercorn which adds a numbing sensation to the lips and tongue. Today I’m making a vegetarian style but it also can be made with meat. This dish is served cold and as long as you keep the cold noodles and the dressing separated it can be stored in the fridge for 24 hours. 1. Bring half a medium pot of water to a boil. Add ½ tbsp olive oil and salt to the water - this will help to keep the spinach green. Blanche the spinach in the boiling water for 1 - 2 minutes. Transfer the spinach in a colander, let cool. 2. Take off all the roots from the bean sprouts and blanche the bean sprouts in the boiling water for 1 minute. Transfer the bean sprouts into a colander, let cool. 3. Add the noodles in the boiling water, and cook for 2 minutes. Transfer to a colander, rinse with cold water and drain the water. Add 1½ tbsp olive oil to the noodles, and then mix evenly. Let cool. 4. In a large mixing bowl, add bean sprouts, spinach, cold noodles and the dressing. Mix it evenly. Serve garnished with diced walnuts and green onion top. 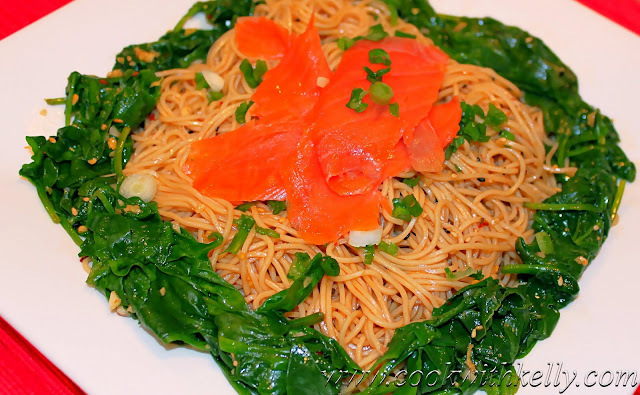 Here is a photo of Sichuan Noodles Salmon Salad - just simply place the smoked salmon on top of the cold noodles, you have this completed fusion seafood meal.